Live The Southern Italian Lifestyle for 7 days! 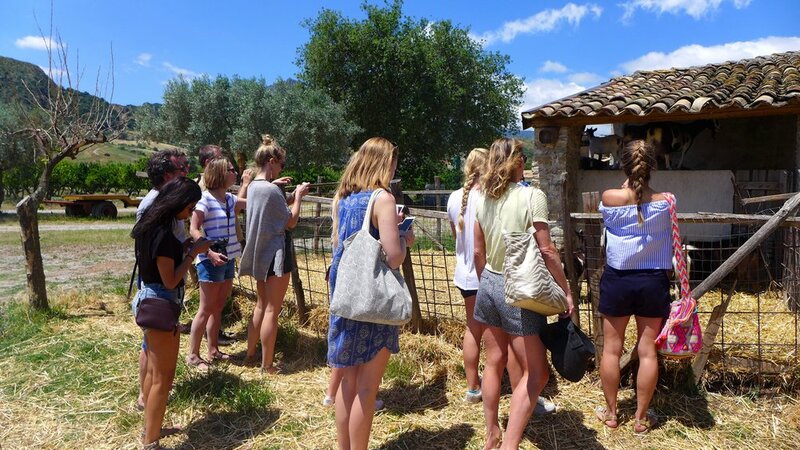 We specialize in exclusive small group tours so you can experience Southern Italy like one of our friends and family members. This is to ensure that our guests experience Italy like a local not a tourist. This also permits us to go to many exclusive locations that can’t accommodate large groups. When you book with Discover Calabria you won’t be a tourist taking photos of all the landmarks, you will be a traveller going deeper within the experience, immersing yourself in the local culture that will transform the way you look at life and learn what it truly means to live the Southern Italian lifestyle. Discover Calabria is the winner of the Lux Life 2018 Award for most outstanding wellness retreats, Italy. Read some our past client’s testimonials here. Discover Calabria would like to invite you to discover The Secrets of Calabria. Designed so you can unwind from your busy life, slow down and experience Southern Italy’s best kept secrets. You will enjoy delicious seasonal meals in majestic settings, visit breathtaking sites, be immersed in local culture, and learn the secrets of how to live a simpler life with passion. The essence of the Southern Italian lifestyle. Your home for the week will be in Reggio di Calabria, a vibrant beach town built above an ancient city. Reggio has a beautiful beach boardwalk that has been named the most beautiful kilometre in Italy and it is! Each evening you will breathe in the beautiful sea air while you witness the sky change colours as the sun sets behind Sicily. Your accommodations will be at a modern boutique hotel only a few minutes walk away from the beach, the main piazza and the corso which is a pedestrian only street full of boutique shops, cafes and restaurants. At night the city comes alive with locals going for their evening stroll or on their way to one of the popular beach bars. You will never be bored in Reggio as the city can be as relaxed or fun as you prefer. Each day you will get to discover a new place, the beautiful beach towns of Scilla & Tropea, the medieval village of Gerace, Sicily’s most active volcano Mount Etna and the chic hilltop town of Taormina famous for its celebrity sightings, artisan shops and stunning panorama. The culinary traditions of Calabria are steeped in centuries of history. Many of the recipes and ingredients used in the cuisine have been brought over from the nations that have invaded and conquered Calabria since the beginning of history. The Greeks, Romans, Byzantine, Saracens, Normans just to name a few. Many different cultures have gifted Calabria with their unique ingredients and recipes, and what remains today is an eclectic blend of flavours influenced by these cultures. Fresh pasta made by hand, natural breads, sun ripened fruits and freshly picked vegetables, meat from farm raised animals, fresh cheese, organic olive oils and local wines from ancient soil. You will experience food pleasure in its finest form. Your meals will be enjoyed at a variety of destinations. From secret beach locations to top rated restaurants, each place personally selected. All meals will consist of seasonal, natural and local ingredients in honour of the slow food philosophy and all dietary requirements can be accommodated. You will enjoy all the delicious recipes that Calabria has become famous for. Your bilingual host will be Michelle Pedullà, the founder of Discover Calabria. She has carefully selected every restaurant and location based on her own personal experiences of living in Calabria. She has a passion for entertaining and loves sharing her knowledge about Southern Italy and its simpler lifestyle. Her goal is to guide you on an experience that will transform the way you live and travel. You can read Michelle’s story here. Pricing Includes: Boutique accommodations all rooms have private bathroom, air conditioning and mini fridge. Daily breakfast + mediterranean lunch and dinners with wine. All excursions, tours and activities. Pricing Does Not Include: Flight, insurance or airport transfers. There are two main airports in Calabria that service international and regional airlines. These are Lamezia Terme and Reggio Calabria. The Reggio Calabria airport is the closest airport located in the town centre. The airport code when booking is REG. Or you can fly into the Lamezia Terme Airport. The airport code when booking is SUF. Alternatively you can book a flight into Rome then book a connecting flight directly to either the Reggio Calabria or Lamezia Terme airports. Please let us know what time you will be arriving and we can arrange to have a driver waiting for you at the airport. For more information on how to get to Calabria please click here. IF YOU HAVE ANY questions REGARDING THIS TOUR please fill out the form below.